In Cargomobilities, a new site-specific work in the Atrium Gallery at the Museum of Contemporary Art Jacksonville, Tallahassee-based painter Joelle Dietrick creates a multilayered mural of paint and adhesive fabric to present a visual commentary about the interconnectedness of macro economies and micro systems. Fascinated with geolocation data for cargo ships and shipping containers, the artist employs a glitch art aesthetic that allows her to analyze, recode, manipulate, and visualize data into a pulsating scene of cranes, cargo ships, and houses. Producing Cargomobilities, the largest mural of the new series, is no small feat. What begins as an intensive computer-based research project in the artist’s studio results in an equally laborious application of paint and adhesive material on the gallery’s walls. To start, Dietrick mined years of data from larger informational technology (IT) systems, such as the housing market from 2005 to 2015 and geolocation data for cargo ships. In doing so, she found inspiration in their complex data patterns. 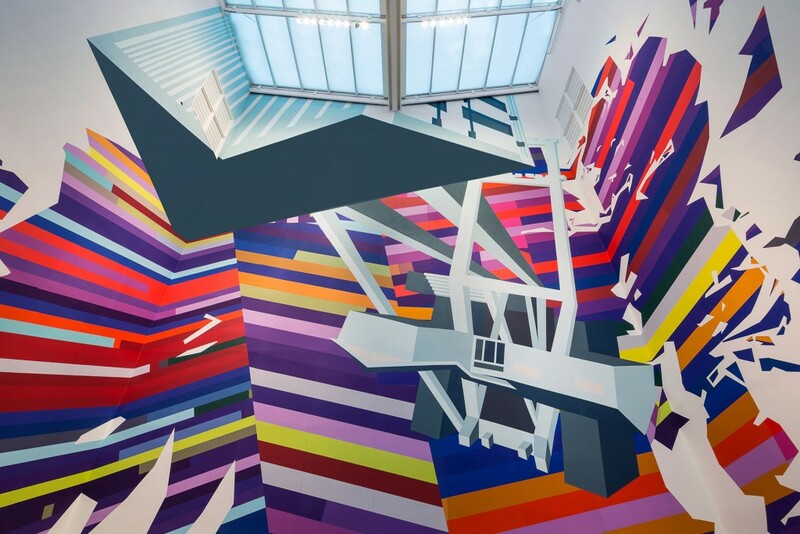 She then transformed the failures of said systems into an abstract, hyperactive environment of fragmented houses, shipping containers, and cranes. As the layered forms suggest the physical scale of these economies, the images’ wall placement echoes the complicated IT patterns and glitches as well as the reverberations of one market crash onto the other. Joelle Dietrick’s paintings, drawings, and animations explore contemporary nesting instincts and their manipulation by global economic systems. Her recent artworks and research consider housing trends that complicate our relationship to place, particularly the notion of home in the wake of the housing industry collapse. Her work has been shown at Transitio_MX in Mexico City, TINA B Festival in Prague and Venice, Museum of Contemporary Art (MCA) Chicago, MCA San Diego, Long March Space Beijing, ARC Gallery Chicago, Soho20 New York, and MPG Contemporary Boston. She has attended residencies at the Künstlerhaus Salzburg, Anderson Ranch, the Virginia Center for the Creative Arts, Banff Centre for the Arts, and the School of the Visual Arts and received grants and fellowships from the National Endowment for the Arts, the University of California, Florida State University, and the Deutscher Akademischer Austausch Dienst (DAAD).